I am in the high arctic less than a thousand miles from Earth's north pole in a location chosen for its resemblance to the planet Mars. Here, I, and my small team, will transmit a series of webcasts aimed at children participating in summer activities sponsored by the Mars Institute, Challenger Center for Space Science Education, and The Explorers Club. On the way up to Devon Island I had a chance to fiddle with my latest gadget - er, I mean tool: a new iPhone. One of the things I put on it was a film I saw in high school called "Silent Running". At the time the film had quite an impact on me. It was the early 70's. Earth Day was a recent and still a somewhat nascent idea. People were learning how to protest and express concern about what we were doing to our planet's life support system. And dire predictions emerged about what might happen in a few years if things did not change. Flash forward a third of a century. The film is, in some ways, a little nonsensical and naive. But if you can suspend that aspect for a bit, the film is rather prescient - in that it resonates with "green" theme" we all find ourselves grappling with today. The premise of the film's story was simple: the remaining wildlife and plants on Earth had been collected and placed in some specially equipped domes. These domes were carried around the solar system on commercial space cargo ships to preserve them for some TBD future purpose. Eventually, evil (and uncaring) corporate forces call for their nuclear disposal such that the ships that carry them can return to commercial service. A prototype of today's eco-warrior (played by Bruce Dern) named "Freeman Lowell" and his little robot pals save the domes and their contents - but at great cost. As the movie closes, a single dome, glittering like a piece of Victorian glassware, floats off into space, alive with a forest within, tended by a little robot - like a bottle tossed into a vast cosmic sea bearing a message. The movie is pretty to look at and stands up surprisingly well given what can be produced today. There is one thing in particular has stayed with me all these years: imagery of Freeman Lowell inside the domes, luxuriant with plant growth, while extraterrestrial scenes such as Saturn and its rings loom outside. 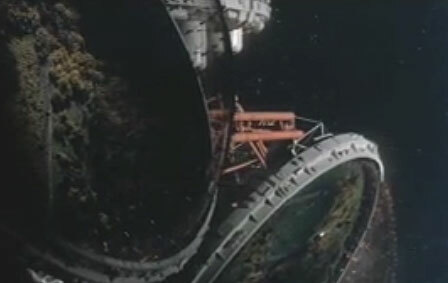 Indeed, the views (by director and special effects master Douglas Trumbull) were so stunning that they were ripped off and used again in several Sci-Fi TV shows. Today people talk about terraforming Mars and giving it a carpet of life - and re-terraforming Earth (green buildings etc.). All the while, concerns about global warming and its effects upon earth's biota are starting to cause geopolitical forces to shift the way our world works to offset these trends. So ... while the narrative premise that underlies the film may be a bit off, the notion that nations and transnational corporations would be making profound decisions about life on Earth, our effect upon it, and its ability to support that life is something that is almost ripped from today's headlines. 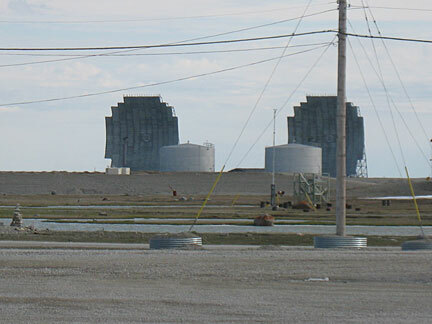 One of the people who is visiting Devon Island this year is NASA's Chris McKay. Chris is widely known as an out of the box thinker who tries to place life on Earth - and Earth itself - in a context wherein we understand out significance - and insignificance - in the grander scheme of things. Chris and another Devon Island visitor, biologist Rob Ferl had an interesting idea a few years back one, which many dismissed as theatrics - but I thought, was inspired. It was called (among other things) "A Rose on Mars". This mission would answer a whole series of question rather simply with regard to the ability of Mars to support Earth life. Some Martian soil, ice, and atmosphere would be put into a growth chamber and some terrestrial seeds would be planted. If they did manage to grow, how they grew would answer rather simply the question about the ability of Earth life to thrive on Mars. SpaceX Founder Elon Musk was taken with this idea and initially pursued it as a precursor to his rapidly expanding interest in space exploration - one that eventually morphed into SpaceX and its Falcon launch vehicles. There is one mental image that I gleaned from this "Rose on Mars" concept - one that resonates with "Silent Running" - and with Devon Island: a small shiny enclosure alone in a hostile place - within which a piece of Earth's biota thrives. 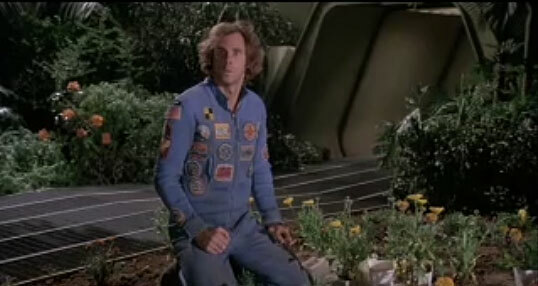 It is this mental image that I had in mind when I first suggested to my SpaceRef business partner, Marc Boucher, that our company might want to consider donating a greenhouse to the Haughton-Mars Project. When I was in grad school (and also teaching) my initial research project had to do with radiation dosage and possible effects this would have on plants exposed to zero gravity. As part of this research I would have used some seeds retrieved from the LDEF (Long Duration Exposure Facility) a school bus-sized structure with a variety of payloads aboard that had been left in space a year or so earlier by a Space Shuttle. 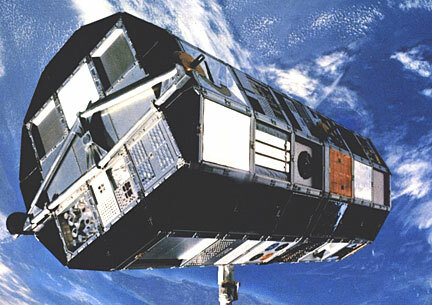 The LDEF satellite was scheduled for retrieval in early spring 1986 - the mission after Challenger's last flight. Needless to say, with Challenger's loss, LDEF became the "very" Long Duration Exposure Facility and stayed in orbit far longer than anyone had expected - well beyond my ability to incorporate these particular tomato seeds into my research. LDEF had originally been launched by Challenger in 1984 and was eventually brought back to Earth by Columbia in 1990. Both shuttles that carried it have now been lost. When the greenhouse was first assembled in 2002, I planted some seeds that had flown aboard LDEF in a small growth tray. Due to the hectic pace of things, I was not able to tend to them properly and they did not sprout. 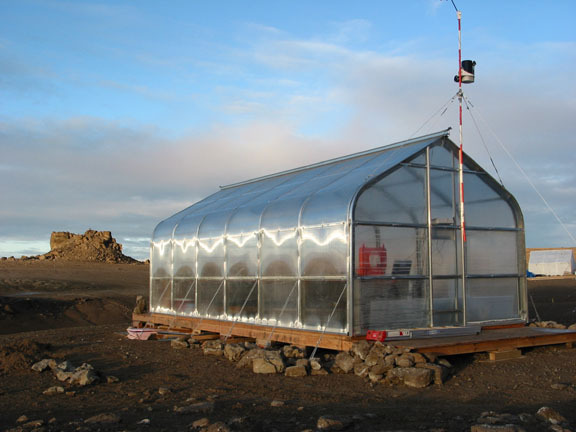 Yet some of those seeds had finally met with soil and moisture inside a greenhouse designed to eventually mimic a greenhouse we might one day find on Mars. I like to think that this greenhouse was christened, in a way, by seeds that had lived (albeit dormant) in space. 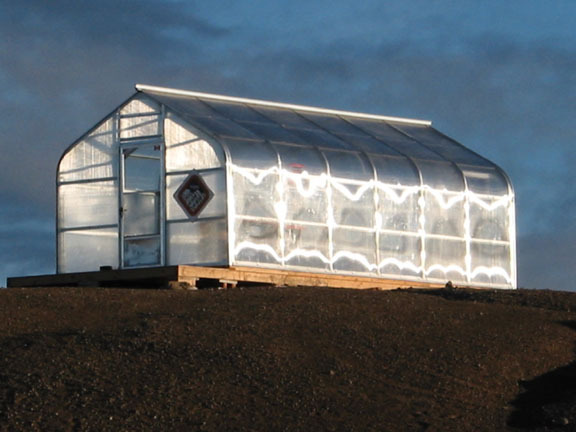 Our greenhouse on Devon Island is 24 feet long, 12 feet wide, with a 3 foot porch in front (entry way) and in back (batteries) i.e. 30 feet long. By coincidence, LDEF was 30 feet long and 14 feet wide - nearly identical in size to our greenhouse. Now, five years later I find myself working in conjunction with the Challenger Center for Space Science Education - and the construction of a memorial inukshuk (an Inuit stone structure) to the crew of Challenger. I helped organize an effort to build an inukshuk for each of the Columbia's crew back in 2003. When she sent me these mementos, one of the few she has from that briefcase, Scobee's widow, June Scobee Rogers included a note to me in which she said "Looks like we share similar missions - inspiring, exploring, learning". As we conduct our activities another teacher, Barbara Morgan, prepares to fly into space aboard Space Shuttle mission STS-118 - as an astronaut, While she has many duties assigned to her, one thing she will do is pickup where teacher and Challenger crew member Christa Mcauliffe left off - and will conduct a lessons from space. As she prepared for her mission, Barbara sent our team note saying "Best wishes to Leroy, Reads, Matt, and Keith on their Teaching Expedition to Devon Island. I look forward to learning all about it when I return from space." Things that happen in the past often propagate forward and intrude into the present over time - again and again - and do so in subtle and ironic ways. Often times we are not fully aware just how we are being guided by things that have affected us in the past - until the whole picture begins to unfold in the present. Indeed, all of these synergies I have jotted down here only began to resonate as I sat in a plane flying up to Devon Island the other day. So, over the next few days, as we teach from Devon Island, I hope to take several late night walks to that little hilltop and gaze back at our little jewel of the arctic. As I do, I wonder what other synergies lay waiting to be (re) discovered. 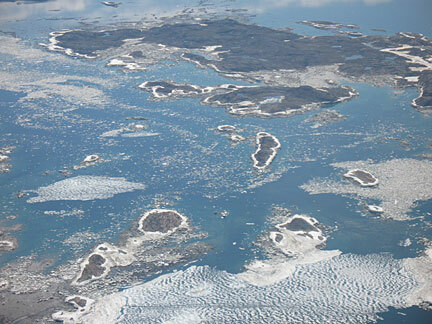 The Haughton-Mars Project (HMP) is an international interdisciplinary field research project centered on the scientific study of the Haughton impact structure and surrounding terrain, Devon Island, high arctic, viewed as a terrestrial analog for Mars. The rocky polar desert setting, geologic features and biological attributes of the site offer unique insights into the possible evolution of Mars - in particular the history of water and of past climates on Mars, the effects of impacts on Earth and on other planets, and the possibilities and limits of life in extreme environments. In parallel with its science program, the HMP supports an exploration program aimed at developing new technologies, strategies, humans factors experience, and field-based operational know-how key to planning the future exploration of the Moon, Mars and other planets by robots and humans. 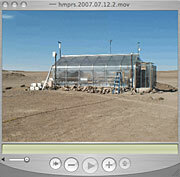 The HMP managed jointly by the Mars Instituteand by the SETI Institute. 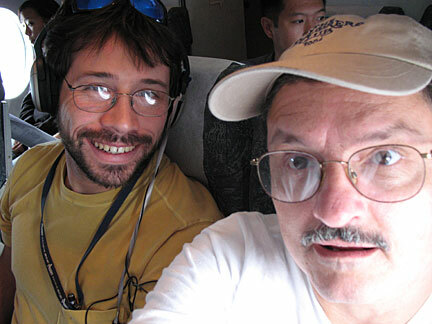 7 July 2003: Part 1: Being here - and being there.